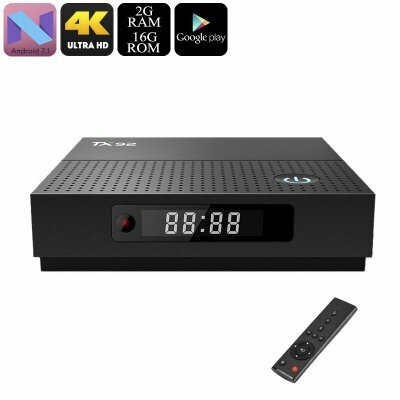 Successfully Added TX92 Android TV Box - Android 7.1, 4K Support, Bluetooth, WiFi, Google Play, Octa-Core CPU, 2GB RAM, DLNA (16GB) to your Shopping Cart. If you’re looking for an easy and affordable way to bring fun into your home, the TX92 Android TV Box is perfect for you. This little gizmo can be easily attached to your regular TV set after which you’ll be able to enjoy the latest Android features straight from your big screen television. Once it place, you can watch movies, play games, enjoy TV apps and even browse the web. Offering many forms of entertainment, this Android Media Player is the perfect gadget to keep yourself, friends, and family entertained during the cold upcoming winter months. It comes with Google Play and TV Center 17.4 installed, meaning you have access to plenty of free media for you to enjoy. The TX92 Android TV Box runs on the latest Android 7.1 operating system. Thanks to this, you’ll be able to enjoy all the amazing features Android has to offer without ever encountering any lag. Within its compact body, your Android Media Player holds an Octa-Core processor and 2GB RAM. This hardware lets you tackle demanding Apps, games, and movies without dropping a frame. To further increase your overall user experience, the TV box supports DLNA for easy file sharing as well as Miracast and Airplay. By supporting Ultra-HD 4K resolutions, this 4K TV box lets you undergo a cinematic experience from the comfort of your own sofa. Never before, have you been able to enjoy your favorite films, series, and sports game in such detail and color. You’ll be treated to plenty of storage with 16GB ROM and a 64GB SD card slot. Alternatively, you’ll always be able to stream media straight from the web thanks to its WiFi support.